Can these two make a special run to the finals? Even though the Bulls are favored, I think this games going to be a lot closer than you think. For once, the Hawks showed resiliency and played DEFENSE in the post-season. The Orlando Magic’s entire team, besides Dwight Howard, struggled to get into rhythm the entire series. If they want any chance of upsetting the Bulls they must continue to defend the basket. Offensively, the Hawks must attack the rim. At times against Orlando, they would settle for bad jumpers and wouldn’t share the basketball. Their defense was able to bail them out, but they better not get lazy against Chicago. The Bulls have the “most likely” NBA MVP, Derrick Rose, and he was unstoppable in Chicago’s opening series (or should I say all season?). I have no doubts that Rose will continue to put up his huge numbers. Even though Rose has been tearing it up, Chicago must find another player to go to down the stretch. Eventually, Rose is going to fall short in the final minutes. You can’t rely on him to bail you out every time. Bulls, Carlos Boozer: Boozer needs to get it going offensively. He only averaged 10.0 points in the opening series, which is way under his regular season average (17.5). Chicago didn’t sign for his services just so he can score 10 points a game in the playoffs. Hawks, Jamal Crawford: In my opinion, he was one of the main reasons why Atlanta was able to beat down the Magic. He averaged 20.5 points off the bench and outscored the entire Orlando bench in multiple games. He needs to stay red hot as Atlanta lacks depth compared to Chicago. As we expected these two new rivals meet again. Both teams enter the second round after breezing past their opening opponents. The Heat are finally looking like the scary team we were waiting for. I have no idea how Boston is going to slow down their big three, but they must find a way. LeBron James has quietly put up MVP like numbers and he will be the focal point Miami’s offense. Boston’s front court must be able to protect the paint. Not only against James, but the Celtics must keep the Heat from scoring in the paint. Miami isn’t the greatest jump shooting team and tends to run into scoring droughts when settling for jumpers. Both teams match up well and this one can go either way. It’ll be interesting to see which big three comes up on top. Heat, Chris Bosh: LeBron James and Dwayne Wade have continued to put up monster numbers all season, but Bosh has had an up and down year with the Heat. He stepped it up in the opening series which helped Miami take care of business. Whenever Bosh plays great the Heat play great. He needs to play aggressive and attack the rim instead of settling for jumpers. Celtics, Rajon Rondo: The Celtics will go as far as Rondo takes him. He is the facilitator of the Celtic offense. Rondo torched the Knicks in the 1st round, not only with dishes, but also scoring the basketball. In Boston’s three wins over the Heat, Rondo had 17, 16, and 10 assists. He only had 5 in their one loss to Miami. If Rondo can exploit Miami’s poor point guard play they will win the series. I don’t think anyone expected the Grizzlies to make it here as they dominated the San Antonio Spurs in the 1st round, making it one of the biggest upsets in NBA history. The Grizzlies have played excellent defense in the post-season and as they continue to use their physicality to their advantage. Zach Randolph and Marc Gasol were unstoppable in the opening series, but they will have their hands full against the Thunders’ bigs, Kendrick Perkins and Serge Ibaka. I don’t believe they are going to be as dominant as they were against the Spurs. Oklahoma City isn’t small or weak. They also have two superstars in Kevin Durant and Russell Westbrook. If Memphis wants to keep their miracle run going, they must get high production from their back court and continue to play aggressive on both ends of the floor. Thunder, Serge Ibaka: His match up against Zach Randolph will be critical in this series. Randolph displayed his dominance against San Antonio and has the abilities to dictate an entire series. If Randolph dominates the point it could be a long night for the Thunder. Luckily for them, Ibaka led the NBA with most blocks and leads the playoffs with 4.8 blocks per game. Not only will he need to defend the rim, but he must be able to rebound the basketball. Grizzlies, Mike Conley: In my opinion, Conley outplayed Tony Parker in the opening series, but will have his hands full against Russell Westbrook. Conley must continue to play with consistency, as his point guard play will be vital in this one. In his first playoff series, he was able to cause havoc for San Antonio. He isn’t afraid to hit the big jumper or attack the rim. He needs to have a good series if Memphis wants another upset. The Mavs finally got the monkey off their back as they prevailed in 6 against a tough Portland squad. It was a huge relief since they have been trounced in the opening round in three of their last four post-season trips. In my opinion, this is a favorable match-up for the Lakers. Lakers struggle against teams with quick point guards. No disrespect to Jason Kidd, but he’s not exactly quick. Also, the Mavericks don’t have physicality in the post. Dirk Nowitzki is more of an outside shooter and Tyson Chandler can’t do much in the post. Dallas is more of a jump shooting team. If Dallas wants success they must win the points in the paint. In their huge breakdown against Portland, Dallas settled for jumpers instead of going inside which started the undeniable comeback. They cannot allow Pau Gasol and Andrew Bynum control this series. Dallas’ bench must be able to show another strong performance as well. Jason Terry and Peja Stojakovic were tremendous. They must show up again. It’s hard to believe will be the first time Kobe will go up against Dirk in the post-season. Lakers, Gasol and Bynum: The Lakers must feed these big guys as they were the difference makers in LA’s two wins over the Mavs during the regular reason. They dominated the paint against Dallas. Both big men have the abilities to change a game and their presence must be felt. Their performance will dictate how far the Lakers will go. Mavs, Jason Terry: Terry was huge for Dallas in the opener as he displayed his magic touch from the outside. Terry is key to Dallas’ success. He must give Dirk from support and continue to hit big shots. If he can hit his 3’s they can be a tough team to beat. The Bulls were predicted to be a good team, but nobody expected them to be the #1 ranked team heading into the playoffs. While Chicago is looking to make a deep run into the playoffs, the Pacers seem happy to be in the playoffs. However, the Pacers do have some players and can make this series interesting. The advantage the Pacers seem to have is size. Granger is big for a small forward and can bully other players in the paint. Hibbert is also one of the few remaining true 7 ft centers in the NBA. Outside of having the NBA MVP on their roster, the Bulls also have a solid set of complimentary players. Boozer is an athletic PF who should have no troubles with Hansbrough. Noah is a solid 10 & 1o player who will get looks off of pick and rolls. Deng is also a solid SF who plays well on defense and can shoot from deep. For the Pacers, they need to make sure they get out to early leads and attack the Bulls. Chicago on the other hand needs to use their superior talent and athleticism to get by the Pacers. The Bulls might lose one our two, but in the end should win this series. Luol Deng, Bulls: Rose is going to get the hole and has Boozer down low to feed the rock, but a third player needs to step up. Deng needs to knock down perimeter shots when fed the ball and lock down Danny Granger. Roy Hibbert, Pacers: I wanted to say Collison, but Hibbert needs to dominate in the paint and prove that he can be a force in the middle. He will need to eliminate his inconsistencies and lock down Noah. As sad as this is, I don’t think Philadelphia competes with the Heat in the least bit this series. Whenever you think of first round blowouts, this is what I have in mind. The Sixers have some solid players, but when compared to the Heat they only true advantage they have is at PG. Holliday is starting to come into his own while Bibby and Chalmers are decent at best. However, Miami has three superstars which will give Philly fits. Everyone knows LeBron James and what he brings to the table. I honestly don’t see a single player on the other team who will be able to stop him. It might get interesting if the put Igudola on him, it might get interesting, but that still leaves Dwayne Wade going against someone like Jodie Meeks. The biggest advantage I see for the Heat is down low. Elton Brand has had a nice season, but I think Bosh and his size will give the shorter Brand problems. Overall, this should be a relatively boring series that ESPN will give too much coverage to because of the names on the Heat. Chris Bosh, Heat: The “third” wheel needs to step up in a big way, most likely against fellow big Elton Brand. If he plays the way that everyone knows he is capable of playing, than this series should be over fairly quick. If he doesn’t, perhaps Philly can sneak a game (or two?) from the Heat. Jrue Holliday, 76ers: When this kid makes plays, the 76ers seem to win. That might not necessarily hold true in this series; however, if he does play well, then that will at least give them a chance…right? I’ll be dead honest; I have a strong aversion towards the Celtics. I’m sure it’s how everyone else feels about the Spurs; they want them to lose, but they keep winning despite age. It also doesn’t help they always seem to take series down to the 7th game every single time. The Knicks are interesting to me as they are with everyone else. They made a blockbuster trade to get Carmelo, and have settled into mediocrity. A lot of this has to do with their offense. They seem to settle early and take too many three pointers. They need to figure out how to work together on both ends of the court and start meshing as a team. The Celtics also made a mid-season trade giving up Kendrick Perkins for Jeff Green. Since then, they haven’t been the same down low in the paint and have been mediocre as well. Both teams however only have one star down low so the fact that Boston has gotten smaller shouldn’t hurt them. As cliche as it is to reference a star player, Anthony needs to body up Paul Pierce and take him down low. He can dominate based on his size. I think the Knicks make it interesting, but the Celtics know what it takes. Rajon Rondo, Celtics: It’s been a bit of a down year for Rondo, but he always seems to step up in the playoffs. This year is no different. He needs to take command of the Celtics and lead them through the series. Chauncey Billups, Knicks: Billups was brought over from Denver along with Anthony and has played well. However, he’s 3-point percentage has slipped. Billups will get open looks so he needs to be ready for them. The first thing I thought of when I saw this match up was Dwight Howard against Al Horford. Howard is arguably the most dominant center in the league while Horford is of all-star calibur and plays in similar fashion. Seeing these two go at it will be fun. For Orlando, it’s the same team as always with a few different players. They will shoot early and often from deep and I can’t blame them with Richardson, Reddick, and Turkolu. Of course, going down low to Dwight is a pretty nice option as well. Expect to see screens to set up those looks from deep. For Atlanta, I like Joe Johnson’s matchup against Richardson. Johnson can score in just about every way imaginable so I think he should be able to put up a high number of points. The key here will be experience. Orlando has been to the finals and constantly make deep runs in the playoffs. Atlanta on the other hand hasn’t seemed to be able to make a deep playoff run in forever. They may be matched up similarly, but Orlando knows what it takes to make it in the playoffs. Hedu Turkolu, Magic: For some reason, Turk only plays well for Orlando. Based on what he’s done in the past, Hedu could make the difference and play the X-Factor as he has just a few years ago. Josh Smith, Hawks: When Orlando traded away Lewis, they gave up some definite size as they had him at PF. Josh Smith is uber athletic and a force down low. If he can focus and stay in the paint, he can dominate. Jeff Green and Kendrick Perkins are trading locations; did Boston get jobbed? The deadline has come and gone, but not without an unprecedented flurry of moves. But before we get to the deals, I would just like to give myself a pat on the back for nailing 4 out of 5 teams in my preview of top 5 most likely buyers at the NBA trade deadline. Outside of Chicago, I nailed it (I even got Boston right!). Okay, now that I’m done making myself feel good, let’s get to the top 5 trades of the 2011 deadline. (Side note: I’m not including the Melo deal or D. Williams deal). This was the big one of the day. In acquiring Perkins, the Thunder get the big defensive presence down low that they so desperately needed, and get a nice scoring punch off the bench in Nate-Rob. 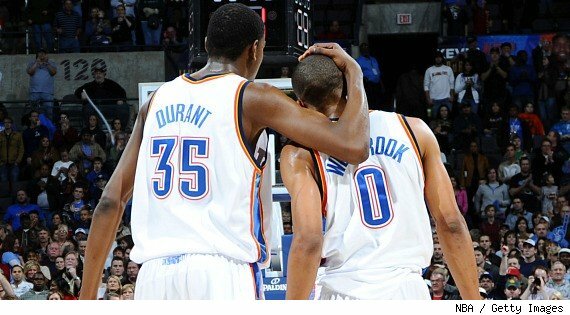 From OKC’s perspective, I like what they did…a lot. Boston? Not so much. Acquiring Jeff Green would have been nice if they needed a combo 3/4 that could score a little; they already have that, however, in Glen Davis. Also, Jeff Green is not a good rebounder and is an even worse defender. Why give up a key cog in Perkins, a huge defensive presence, for Green? It just doesn’t make sense and really leaves a gaping hole down low for the C’s. Who do they turn to now? A potentially bought-out Troy Murphy? The Trail Blazers were adamant about making a deal at the deadline and they did not disappoint. In acquiring Wallace, they get a nice, athletic combo-forward who can score and can rebound very well; he will add yet another dynamic piece to a roster that includes Nicholas Batum, Wesley Matthews, LaMarcus Aldridge and Brandon Roy, who if healthy, might be able to provide a bit of a spark (although, I believe that is highly doubtful). The Bobcats acquire a center in Przybilla and a probable “throw-in” in Cunningham; Marks is a definite “throw-in”. What they really got here were the 2 first-rounders. I like what Michael Jordan did here as they were able to shed Wallace’s big contract and acquire 2 high quality picks. Cleveland is in full-tilt rebuild mode now, but acquiring Baron Davis, who still has $28 million due to him over the next 2 years is a real head-scratcher. Sure, they get a first-rounder (a potential top-10 pick), but was it really worth picking up Davis’ tab? They did well here in shedding their own salaries in Williams & Moon, but taking back an even bigger one doesn’t seem real smart on their part. L.A., on the other hand, acquired a still relatively young point guard in Mo Williams, who has some serious talent. Along with Eric Gordon and Blake Griffin, Williams seems to form a pretty nice nucleus of players that might be looking at contention sooner rather than later. Atlanta realized that it didn’t have much of a shot of getting out of the first round of the playoffs with Mike Bibby as their starting point guard. So what do they do? They acquire journeyman Kirk Hinrich, a guy, who I think, will be a good player in Atlanta, and someone who puts them in a better chance of getting out of the first round. Stuck behind rookie John Wall, Hinrich will also provide more of a scoring punch than Bibby was able to do, and should be a better assist man and rebounder. Washington did well in getting Atlanta’s 2011 first-rounder, which should sit somewhere around 18-22. Also, I think Jordan Crawford has the potential to be a good player if given playing time. Outside of that, it was a sheer cost-cutting move. Because of that, I can’t give them too high of a grade. Man, I just don’t see how GM Daryl Morey was somehow able to get 1st-rounders out of both of these deals. I sorta can see how it was possible in the Brooks deal, as the kid just won Most Improved player last year (even though he has been brutal this year), but a 1st-rounder for Battier and Smith? I don’t see it. All-in-all, I think Houston cleaned up today and improved themselves for down the road. If they can get anything out of Thabeet, this is a major coup for the Rockets. Memphis gets a guy in Battier who was loved in Memphis until he was traded for Rudy Gay on draft day 2006. Battier will also provide good defense and should maybe score a bit more for the Grizzlies, especially with Gay out for a while. The Suns acquire a shoot-first point guard who has trouble doing much else. Yes, I understand that Brooks can light it up, but what else does he do? He doesn’t pass well, he doesn’t rebound well, and he’s far from the 6-foot he’s listed at (try 5’9 maybe). Perhaps a change of scenery is all the guy needs, but as of right now, I’m not a huge fan of what the Suns did today. Another All-Star snub for Ellis? His instant spark off the bench has been vital for Atlanta’s success. He is looking like his same ole’ self from last season. Crawford must keep up the scoring if the Hawks want to contend with the big boys (Orlando Magic, Boston Celtics, and Miami Heat). I don’t think many people expected Houston to be last in their division right now. I didn’t. I believed they were a top ten team in the preseason. Looks like I was wrong. They have been unlucky with Yao Ming, but their roster is full of talent. Luckily, it’s a long season and there’s still enough time for the Rockets to make a push. Will they be able to make a late run? Call me biased, but without this guy the Spurs would not have the best record in the league right now. Neal has stepped into the rotation nicely, hitting big shot after big shot. He is a pure scorer and could be starting for many other teams. Let’s just hope he doesn’t fall into Roger Mason effect. Just look at the number of times Griffin has made ESPN’s top ten plays since the season began. This award is a lock. If he can work on a more consistent outside game, then Griffin could have a shot of being one of the best power forwards ever. Superman has a chance of making it back to back defensive player of the year as he ranks 5th in blocks and 2nd in rebounds. He also happens to lead all centers in steals with 1.24 a game. As a team, the Magic are 6th in points against. This beast can take over a game, defensively, at any moment. I don’t think many people would have thought the Spurs would be 35-6 at this point for season. I didn’t and I’m a huge Spurs fan. Pop has done an excellent job managing our vets all season, with great contribution from our young guys. San Antonio has a chance to finish with the best record in their franchise history. Many will argue Kevin Love, but he was a starter last season and with the loss of Al Jefferson I expected him to a be force for the Timberwolves. Young on the other hand wasn’t even in the rotation to begin the season. I didn’t even know he was still in the league. He has played sparsely throughout his career, but since the Gilbert Arenas trade, Young has seen a lot more minutes. With those minutes he hasn’t disappointed. He has become a legitimate scoring threat for the Wizards. The Knicks went from being a laughing to stock to legitimate playoff contenders in the East; all with the addition of Amare. He started off the season on absolute fire, setting a franchise record for consecutive 30-point games. If the Knicks are able to acquire Carmelo Anthony, then we might have a nasty one-two punch on our hands. Will it be the same story for Atlanta? Middle of the pack, then a first-round bounce? They still have a long way to go if they want to contend with the Lakers, Mavericks, and Spurs. Derrick Rose is stating his case for MVP with his outstanding play. Once Joakim Noah returns from injury, the Bulls can very well be a sleeper to the big three in the East. Injuries have really been a problem for the Jazz this season, but they quietly, continue to win games. They are currently tied with the Thunder for first in their division. Even though the Lakers are slumping, I still expect them to make a run in the West. They simply look as if they are running through the motions, playing lazy basketball right now. Gasol and Artest have looked ordinary this month. Look for the defending champs to play up to their caliber come All-Star break. The Magic have been playing better since the huge trades, beating the Celtics and the Spurs. I still don’t think they are done making moves, as they are very thin at the center position. With their loaded offensive power, Orlando can very well pose a threat to Boston and Miami. With Kevin Garnett going down to a knee injury and Rajon Rondo nursing an ankle injury, I think the Celtics will struggle a little bit. Rondo is expected to return soon and Garnett will be out for a couple weeks. Let’s hope Paul Pierce can hold it down, as these two can recover. This dangerous, Dallas team isn’t too far behind the Spurs. Dirk Nowitzki’s minor injury may cause a little set back, but it shouldn’t be too big of a problem as he is expected back soon. Like the Spurs, the Mavericks have veterans all across the floor and will continue to be a top three team in the West. I’m looking forward to seeing another I-35 showdown in April-May. After dismantling the Lakers on their home court on Christmas, the Heat are beginning to emerge into the team we expected. The Heat have won 16 of their last 17 games. The task of stopping Lebron, Wade, and Bosh looks virtually impossible at this point. Expect the Heat to give opposing coaches ulcers come playoff time. In my opinion, the Spurs are the best team in the league right now. The bench has been huge, especially Gary Neal. Also, with George Hill, Antonio McDyess, Matt Bonner, and James Anderson returning from injury soon, the Spurs may possibly have the best bench in the league. This Spurs team has championship caliber written all over them as Manu Ginobili, Tim Duncan, and Tony Parker continue to anchor the team. The newest "Big 3" looks to be the best in basketball. Will it be good enough to deliver a 2nd championship to South Beach? 1.) Miami Heat – The Heat seem to be the talk of the town these days, and for good reason. Not only did they resign Dwyane Wade, but they also lassoed Chris Bosh and persuaded LeBron James to take his services to South Beach. Not bad, I say. The question quickly became, “who else plays alongside these 3 superstars?” Well, Mike Miller signed. So did Zydrunas Ilgauskas. Resigning Udonis Haslem for $14 million less than what he had on the table from teams like Dallas and Denver was a surprise. All of this adds up to one solitary fact: this is the newest top dog in the Eastern Conference. I don’t see how there can be much debate over that considering a James-Wade-Bosh triad is one of the best the NBA’s seen in quite some time (could it go down as the best of all time?). Throw in a Miller, Ilgauskas, Haslem and a guy like Mario Chalmers, and you have yourself a studly cast of characters that are ready to challenge for an NBA Championship right now. 2.) Orlando Magic – After getting ran off the court in the NBA Eastern Conference Finals this past year, it was apparent that the Magic needed to make some moves to reinvigorate a team that was a year removed from going to the NBA Finals. Though not headliner signings, getting Chris Duhon as a back-up point guard was very saavy; he should be able to help shoulder the load and take some of the pressure off of Jameer Nelson. Also, Quentin Richardson should see plenty of minutes for Orlando, especially after shooting a career high 39.7% from 3-point range last season with Miami. Add this to what Orlando already had on the roster (minus Matt Barnes who will be sporting a different jersey next year) and this team looks solid yet again. I think we see Dwight Howard progress even more this year offensively, and I believe Rashard Lewis bounces back from an abysmal year last year to put up much more respectable numbers. Orlando looks to be a major contender yet again. 3.) Boston Celtics – I’m very up in the air with this team. They still look like they are contenders on paper, but the likes of Pierce-Allen-Garnett are also a year older. Garnett seems to have lost a step if the NBA playoffs were any indication; he just doesn’t seem to have that explosiveness that he once had. Also, losing Kendrick Perkins for who knows how long is a blow to a team that relied so heavily on its defense, with Perkins being a large contributor (literally and figuratively). Couple this with Rasheed Wallace retiring, and it was obvious they had to get a big. They did just that with the signing of Jermaine O’Neal. I’m not overly crazy about the move, but something had to be done and the Celtics responded by getting a guy who can score a little bit and grab some rebounds. Rajon Rondo has quickly established himself as one of the elite point guards in basketball and Pierce can still score in droves. If Allen and Garnett don’t completely break down before season’s end (something I’d expect more from KG than Ray-Ray), Boston can make another run at the title…could it be the last one we see from them for a while? 4.) Milwaukee Bucks – This team looks to be a much scarier squad than I think people believe. Brandon Jennings, a rookie of the year candidate last year, looks to build on his rookie success (15.5 ppg, 5.7 apg, 1.3 spg) and elevate his game to the next level. John Salmons was brought back after helping the Bucks to a 22-8 record after being acquired from Chicago, Chris Douglas-Roberts was added to bolster the bench, and Corey Maggette was shipped in from Golden State to add another scorer and another dimension to a seemingly dynamic offense. With Drew Gooden, and a healthy Andrew Bogut, Milwaukee seems to be sitting very pretty in a much tougher conference than last year. If Michael Redd is healthy, watch out for the Bucks; the “Fear the Deer” adage might be out in full-force again this year. I know this might seem ballsy, but I’m calling the Milwaukee Bucks a contender. 5.) Chicago Bulls – Chicago lost role players’ Hakim Warrick and Kirk Hinrich. Pressed into making a move with a huge amount of cap space, the Bulls came through with the signing of Carlos Boozer. I know it wasn’t ‘Bron or D-Wade, but I applauded the move when it happened and I still stand by it today as I believe it was an excellent signing. They also managed to take his Jazz teammate, Kyle Korver, with him as well. For that, I say kudos. It was a definite upgrade, notably over the Warrick/Hinrich tandem, and makes Chicago a better team than what it was at the end of this past season. That being said, I still don’t see Chicago as a serious threat. Yes, I do believe Derrick Rose is a star-in-the-making, and I do like Joakim Noah’s game a lot, but I don’t believe this team is overly deep (something that is needed now more so than ever in the overly competitive Eastern Conference), and I still don’t see a game-changer on this squad. Look, I love Rose’s game, but he’s the closest thing they got to someone than can take over a game in the 4th quarter and I don’t believe he’s ready for that role yet, at least not on a consistent basis. This is the most apparent reason why I don’t see the Bulls as true threats to win the East. 6.) Atlanta Hawks – You know the Eastern Conference has to be deeper if I have a Hawks squad that won 53 games this past season, and didn’t lose anybody off of that squad, 6th in the conference. Signing Joe Johnson was a must, but it came at a much steeper price tag than originally anticipated. The point guard situation in Atlanta does not look very good right now. I think Mike Bibby’s time as a starting guard in the NBA has run it’s course, yet, do you hand the reigns over to 2nd-year guard Jeff Teague? I don’t think so. Defensively, Josh Smith is as good as they come, but he still needs to take his game up a notch offensively if the Hawks want to move forward. Al Horford seems to be Mr. Consistent for this squad (14.2 ppg, 9.9 rpg last year) outside of Johnson, but they have to get more production from Marvin Williams. He could hold the key to Atlanta’s fortune if they wish to be more competitive this year. Jordan Crawford, a guy they acquired from the Nets, should be someone who sees noticeable minutes as a rookie. I love the kid’s game and fieriness. He seems to have the tools needed to play in the NBA and Atlanta was smart in trading for him. Add his scoring punch off of the bench with Jamal Crawford, and there could be some highly-scored games in ATL next season. All-in-all, Atlanta looks to be a good squad, but not enough to hold up as a serious contender. 7.) New York Knicks – The Knicks have had a very active off-season. They’ve acquired 4 players via S&T, most notably Amare Stoudemire and Anthony Randolph, and they signed Raymond Felton away from Charlotte to run point. Now we sit back and wait to see what goes wrong first…joke, Knicks fans, but you have to wonder if New York did enough to make a playoff run. I’m in the group that believes they did, albeit barely. A starting 5 consisting of some combination of Felton, Chandler, Gallinari, Stoudemire, Randolph/Turiaf/Curry seems to be one that could go out and compete on a nightly basis. Outside of that, I’m not sure how good this team really is. Losing David Lee hurts, and Al Harrington’s scoring prowess is something that might not be easily replaced (I’m stressing the word might). But I believe New York had a nice draft with all 3 picks (Rautins, Fields, Jordan) being 2nd round picks, even though I don’t know how much these guys will contribute as rookies. And I’m very high on Toney Douglas. I think this kid is a solid player who can not only score, but dish out the rock and be a pest defensively. If Kelenna Azubuike is 100% healthy, perhaps he could be a nice pick-up as well, but I just don’t think the Knicks surrounded themselves with enough talent to be considered legitimate threats in the East. 8.) Charlotte Bobcats – When I think of Charlotte, I think of a formidable squad that plays pretty well in the regular season, but could never do any serious damage when it came playoff time. I still stand by that thought. Look, they have some nice pieces in guys like Stephen Jackson, Gerald Wallace and Tyrus Thomas, but outside of those guys, it gets thin in a hurry. They lost starting point guard Raymond Felton to the Knicks, so we will get a chance to see just how good D.J. Augustin is as a guy playing heavy minutes night in and night out. They lost Tyson Chandler to Dallas, although he didn’t play much in Charlotte, yet did manage to get Erick Dampier, a guy who, at the very least, will play hard every game (but won’t put up any significant numbers). The catch is that there is a strong possibility that Dampier is either released or traded before the season starts due to his $13 million non-guaranteed expiring contract. Regardless, the bottom-line is that Charlotte might be a playoff team, but that’s it.